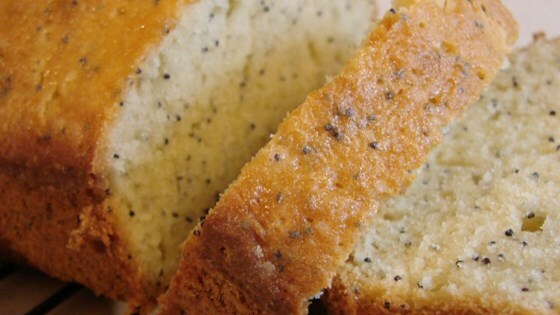 "This poppy seed bread is one of the best ever. If you have ever tasted poppy seed muffins, this is just as good! It is also very simple." Preheat oven to 325 degrees F (165 degrees C). Grease and flour two 9 x 5 inch loaf pans. Mix the flour, salt, sugar, and soda in a mixing bowl. Add vanilla, milk, eggs, and oil. Beat for five minutes with an electric mixer. Stir in the poppy seeds. Pour batter into loaf pans. Bake for one hour. Cool on wire racks. Very good, easy bread. It turned out very moist. This was great! Very simple to make and it turned out so moist and yummy! I don't have a mixer, but it came out fine when I stirred it by hand.